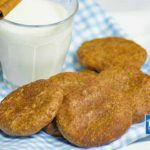 Our Low Carb Snickerdoodle Cookies have all the classic flavors along with crisp edges and a soft, chewy center. In a bowl add the almond meal, cream of tartar, baking powder, cinnamon and natvia and stir until combined. Add the walnut butter and eggs to the dry ingredients and mix well. The dough will be very thick and sticky. In a separate bowl mix together the navia icing mix and 2 teaspoons of cinnamon. Take tablespoon sized scoops of the cookie dough and roll into balls. We used disposable gloves to handle the sticky dough and it make clean up a breeze. Flatten the balls to your desired cookie thickness, we made ours 1/4in/7mm thick. 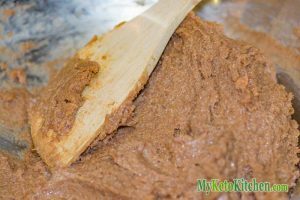 Press the flattened dough into the cinnamon and icing mixture and coat all sides. 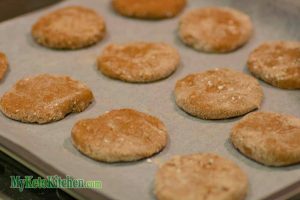 Place the coated cookies onto a lined cookie pan. The cookies do not spread and can be placed close together. Bake for 10-12 minutes. Cookies are done when the edges feel firm and are starting to brown. They will harden up as they cool. We love our cookies still warm, but they'll keep for at least 1 week in an airtight container. Enjoy.